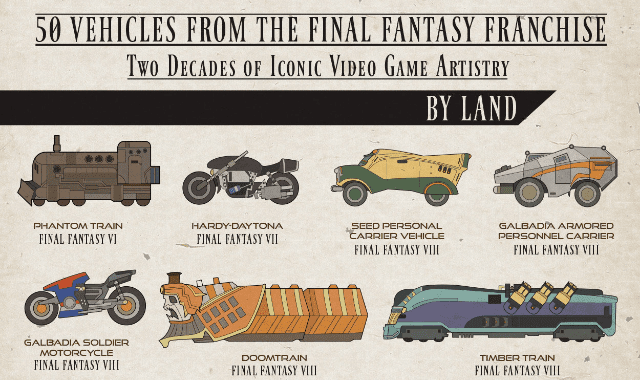 50 Vehicles From The Final Fantasy Franchise #Infographic ~ Visualistan '+g+"
This Final Fantasy compendium celebrates the art and design of amazing airships and vehicles in this gaming universe, which is now more than three decades old. Starting as the last project of the young Hironobu Sakaguchi, who was hoping to end his career in video games on a high note, the first Final Fantasy game’s title was meant to reflect the finality of his masterpiece just as he was about to bow out. Square, which is now Square Enix Holdings, an internationally recognized powerhouse of gaming, was struggling to sell their RPGs and nearing bankruptcy in the late 1980s.